There are reports at Google Webmaster Help and WebmasterWorld from users reporting that Google is reporting they have zero indexed URLs. The report is in Google Webmaster Tools within Sitemaps, the place Google suggests webmasters look to check accurate index saturation count. Since yesterday all my web indexed pages turned to 0. My sitemap is reachable and readable? 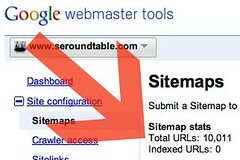 and marked green in webmaster tools. I made no changes in webmaster tools. I wouldn't panic, there are lots of similar reports now. Personally, all the sites I checked were fine. So either Google just fixed it or it is not affected all Sitemap files. We had several similar cases in the past, including in 2008 and a couple in 2010. Again, this should just be a reporting glitch and it should be fine. I should note that Google has not confirmed this as a bug yet, so I cannot be certain. Google Webmaster Help & WebmasterWorld. Update: Google confirmed this is a bug and is only a reporting glitch.